This is one of the most blissful things (in my humble opinion) about growing up in the Philippines…decadent yet fortifying, indulgent yet necessary, over-the-top yet simple and basic (hold on to your garters my friends!) – rice for breakfast. 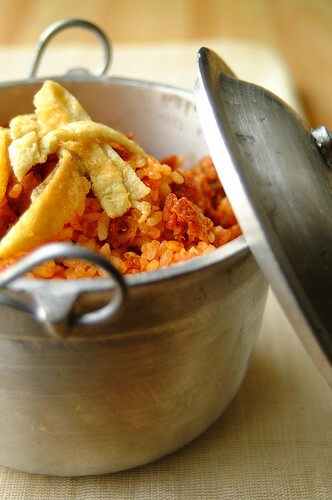 And not just any rice – fried rice! It goes by many names: sinangag, kalo-kalo, sangag. Whatever you call it, it is what has been driving us on for decades. Rice is the fuel for our collective, national “little-engine-that-could“. It is what got us to till the fields at the crack of dawn, cast our nets in the wee hours of morn, and gamely answer vast amounts of call center complaints still wearing a smile on our faces. Rice for breakfast – we salute you! Nowadays, this archetypal “Pinoy breakfast” would consist of rice, a protein (check these Lasang Pinoy entries to get an idea), and egg. A delicious feast! What I decided to do here is just toss everything together to get a hearty one-bowl meal. For the protein I used skinless chorizo. – Heat oil in a wok or kawali. Add onions, garlic, and sili all at once, and sauté until onion is soft. – Add chorizo to the pan and sauté until it has released its glorious orange oil and is just cooked. – Add rice to the pan and toss until rice is orange and soft. Take the pan off the heat and set aside. – In a non-stick skillet heat a little oil. Add egg and cook until set. Flip the egg like an omelet until the whole thing has set. No need for good form here as you will slice it up. Just make it as flat as you can. – Slice egg into strips and toss with rice. You can reserve some egg strips to use as topping. The chorizo gives this dish a bit of a Spanish influence…with one important caveat: The Spanish-style chorizo I used is made right here! I bought it from a friend that makes his own and, yes (! ), he sells it too (details below). It is really delicious and I am presently kicking myself for only buying the 250-gram pack. You can use any chorizo you have though or even longanisa. If you don’t have any skinless (or, as it is locally called “hubad”, which means naked…I love that!) you can use regular and just cut it up as you see fit.